"You know what — we’d better or else my wife is going to kill me for growing a beard. I can’t officially say anything, but this is getting itchy, and I’m getting itchy to go over there and do it." Grunberg was a childhood friend of writer/director JJ Abrams who co-wrote and directed The Force Awakens, and is doing the same for Episode IX. The actor has appeared in every one of Abrams' projects, which makes his return for Episode IX no real surprise. 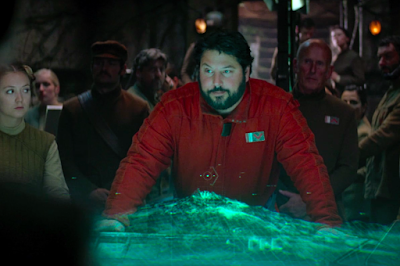 Grunberg had also laid the groundwork for his return to Star Wars while shooting his scenes for The Force Awakens, by refusing the performed the line "I'm hit" so that Snap couldn't be killed of during the battle of Starkiller Base. Snap did not appear in The Last Jedi, despite the film taking place almost immediately after its predecessor. His absence was noted by fans, and is currently being explained in the final arc of Marvel's Star Wars: Poe Dameron comic book series. Marvel's Poe Dameron primarily focused on Poe, Snap, and the other members of Black Squadron prior to the events of The Force Awakens. The final arc traces what happens to Black Squadron when they're not on screen during the films. Filming on Episode IX is slated to begin in a matter of weeks (or perhaps even days), with most of the cast of The Force Awakens and The Last Jedi set to return (with certain obvious exceptions, of course). The film is directed by Abrams with a script he co-wrote with Chris Terrio. Episode IX will hit theaters on December 20th, 2018.